A paternoster or paternoster lift is a passenger elevator which consists of a chain of open compartments (each usually designed for two persons) that move slowly in a loop up and down inside a building without stopping. Passengers can step on or off at any floor they like. The same technique is also used for filing cabinets to store great amounts of (paper) documents or for small spare parts. As a result of safety issues, many such lifts have been shut down, however a small few survive around the world. The largest of these is located in the Arts Tower at the University of Sheffield, which also remains the tallest university-owned building in the UK. First built in 1884 by the Dartford, England engineering firm of J & E Hall Ltd as the Cyclic Elevator, the name paternoster (“Our Father”, the first two words of the Lord’s Prayer in Latin) was originally applied to the device because the elevator is in the form of a loop and is thus similar to rosary beads used as an aid in reciting prayers. The construction of new paternosters is no longer allowed in many countries because of the high risk of accidents (people tripping or falling over when trying to enter or alight). Five people were killed by paternosters from 1970 to 1993. An 81-year-old man was killed in 2012 when he fell into the shaft. Old people, disabled people, and children are the most in danger of being crushed. 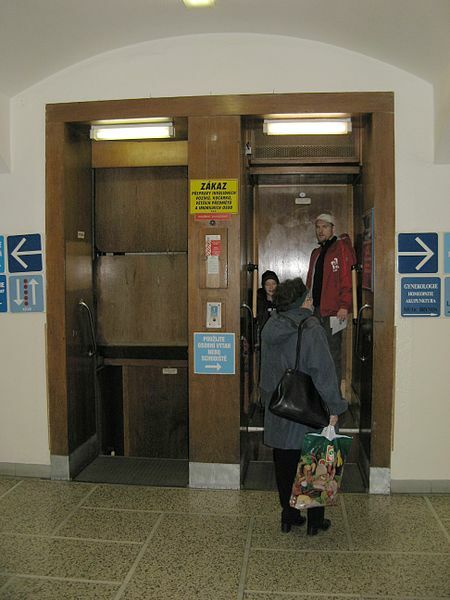 In 1989, the paternoster in Newcastle University’s Claremont Tower was taken out of service after a passenger undertaking an up-and-over journey became caught in the drive chain, necessitating a rescue by the Fire Service. A conventional elevator was subsequently installed in its place. This accident led to an 18-month close-down of all UK paternosters for a safety review, during which additional safety devices were fitted. In April 2006, Hitachi announced plans for a modern paternoster-style elevator with computer-controlled cars and normal elevator doors to alleviate safety concerns. References: The article above is from the wikipedia entry on paternoster lifts and can be found here.